Summer Sunscream 2014: The Electronic Music Festival – DJ JVC | DJ for hire in Philippines | DJ Mixtapes, Clubbing and Music Festivals in Manila, Philippines. TSE live Inc. proudly brings back the biggest summer party in Cebu, “Summer Sunscream“. For the past 6 years, we have been successfully staging this event in different resorts in Cebu and the islands with an average crowd ranging from eight thousand (8,000) to ten thousand (10,000). The biggest crowd we had been thirteen thousand (13,000), whis was in 2011. Summer Sunscream boast of top tier talents in the international and local scenes. We have club deejays, bands, models, actresses and actors providing the ultimate summer ender entertainment year after year. Philippines sought after DJs: XFactor, Marlon Orellano& Cammy V.
Plus the Party Mixes of the Visayas and Mindanao’s Top DJs. Summer Sunscream 2014 the Electronic Music Festival features two stages for the ultimate music and festival experience. The venue (Danao Coco Palms Resort in Danao City, Cebu) will have a festival feel because of its themed set-up and design. 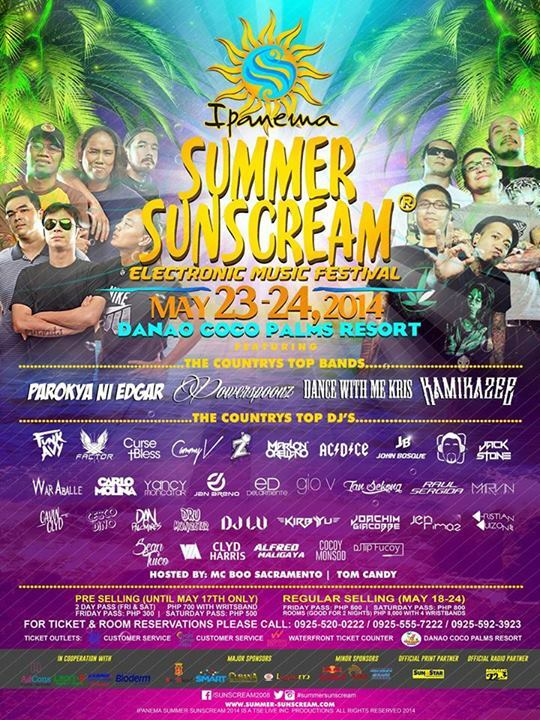 Summer Sunscream 2014 is presented to you by Ipanema. Produced and directed by TSE Live Inc.
Party buses will be provided to those who don’t have a transportation going to the venue. The departure area is at The Walk of the IT Park, Lahug, Cebu City. 2 night stay with breakfast for 2. For updates, visit the Summer Sunscream Facebook Page.